for TechEd, some colleagues (for SAP Mobile: Eric Solberg – for SAP BUILD: Former Member, Former Member Former Member and others) and me setup an end to end hands-on exercise. In this blog, I would like to summarize what the flow of this hands-on exercise was and what needed to be done in terms of configuration to make it work. Our demo persona intended to set up an SAP Fiori launchpad site for a specific user group that should support users that would work both from a desktop computer and their smartphones. A key element of the launchpad was the Manage Products app that should be designed specifically for the user group with the design tool SAP BUILD (including a working prototype and a user study to receive feedback) and then fine-tuned with SAP Web IDE after importing the SAP BUILD prototype. This app should be further enhanced to support native mobile capabilities (in our case a barcode/QR code scanner) and also be made available for direct installation on the smartphone outside the launchpad. In addition to that, SAP Fiori Cloud content should be part of the launchpad and an extension of the My Inbox app was created and added to the site to better fit the requirements of the user group. In addition, legacy content was consumed from the backend and added to the launchpad as tiles as well. Finally, a new theme for the launchpad was created using SAP Theme Designer. Get the accounts: We decided to setup two accounts for each location, so I requested one global account per region (in data centers in the US, Germany, and Japan) and created two subaccounts in each of them. Activate and enable services: We needed to request the following services: Portal, Web IDE, Smart Business, the services for Mobile (Development & Operations Preview and Fiori Mobile Preview), and the UI Theme Designer. 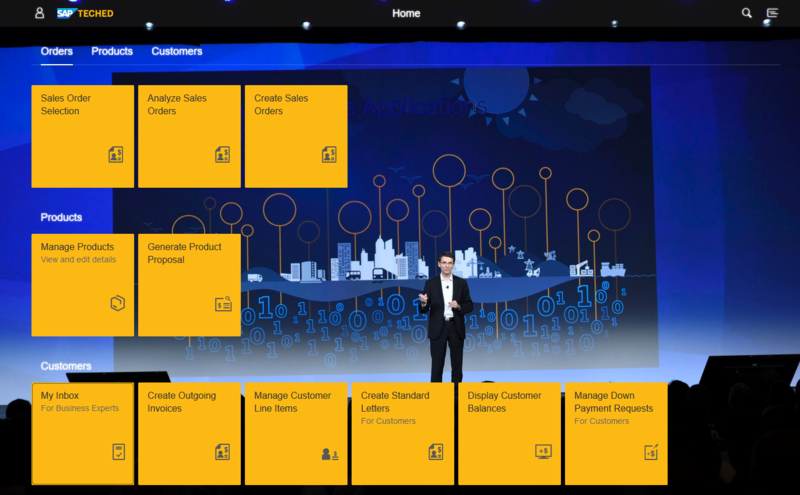 For more details about the Smart Business part, check out my blog about enabling SAP Fiori Cloud Smart Business apps. Cloud Connector: We setup SAP Cloud Connector connectivity for our TechEd SAP Gateway and S/4 HANA system. We created a destination called SAP_Gateway pointing to our TechEd SAP Gateway system, as SAP_Gateway is the name of the default destination for the subscribed SAP Fiori Cloud apps. So, no more additional configuration was necessary or these apps. In addition, we added the SAP Web IDE specific properties to this destination to make it available in Web IDE. For enabling the SAP Fiori Cloud content in a site, we also needed a destination with the same name as the ID of the S/4 HANA system in our Gateway. It was also used for consuming legacy content directly from the backend. For enabling notifications in the SAP Fiori launchpad, we needed a destination notifications pointing to our SAP Gateway system as well. For SAP BUILD integration, we created two destinations called build_plugin (going to https://www.build.me/webideplugin) and BUILD-Production (going to https://www.build.me/webide). In Cloud Platform Portal, we created a site including a role (assigned to some subscribed catalogs) and some groups (assigned to some SAP Fiori Cloud apps and our role) as an example of an SAP Fiori launchpad site with SAP Fiori Cloud content. You can find more details on that last step in the first video on the end-to-end flow of the exercise Build your own SAP Fiori launchpad site that I will publish on SAP Community soon.